Most waterfowl can walk fine on land, and the majority of species are pretty agile in terms of their terrestrial abilities. But some species are so specialised for life on water, and have their legs placed so far back on their bodies, that any terrestrial abilities are poor, if not hilarious. One often reads of how divers (or loons) are only able to move on land with an awkward shuffle; less well known is that some waterfowl are pretty much the same. One of the weirdest of waterfowl has to be the Musk duck Biziura lobata [image above from wikipedia]. This is a lekking species that shows extreme size dimorphism: males can be about three times larger than females (males can weigh as much as 3.8 kg, and females can be as small as 993 g). This is one of the biggest sexual size differences reported among birds (McCracken et al. 2000). Males really do smell strongly of musk. This emanates from the uropygial glands and is particularly strong during the breeding season. They're also notable for having a weird, pendulous dewlap hanging from the lower jaw [image below Â©, by crookrw, from the TOL page]. Musk duck of both sexes sit particularly low in the water, often lurking like submarines. Apart from when females clamber onto their floating nests, and when they're in flight (they fly fairly often and are perfectly good at it), they're never off the water. Musk duck can thus be considered completely aquatic: they never go on land. If captured and dumped on land, they can only slither along on their bellies like seals (Frith 1982). We all associate waterfowl with water, but I assume that few people realise that some waterfowl are this aquatic: like, fully aquatic. Unsurprisingly perhaps, Biziura is a controversial duck. It has often been regarded as a stiff-tailed duck (an oxyurine), and even as particularly close to Oxyura (e.g., Livezey 1997). However, some workers have argued that this position is incorrect and that the similarities shared by Biziura and Oxyura to the exclusion of other oxyurines are convergences (McCracken et al. 1999); others have even found Biziura to be outside of Oxyurinae altogether, and even outside the anatid clade that includes oxyurines, tadornines and anatines (Worthy & Lee 2008). A slightly larger species - B. delautouri - formerly inhabited New Zealand (Worthy 2001) [image below from wikipedia]. Frith, H. J. 1982. Waterfowl in Australia. Angus & Robertson Publishers, London. Livezey, B. C. 1997. A phylogenetic classification of waterfowl (Aves: Anseriformes), including selected fossil species. Annals of Carnegie Museum 66, 457-496. McCracken KG, Harshman J, McClellan DA, & Afton AD (1999). Data set incongruence and correlated character evolution: an example of functional convergence in the hind-limbs of stifftail diving ducks. Systematic biology, 48 (4), 683-714 PMID: 12066296. - ., Paton, D. C. & Afton, A. D. 2000. Sexual size dimorphism of the Musk duck. The Wilson Bulletin 112, 457-466. Worthy, T. H. 2002. The New Zealand musk duck (Biziura delautouri Forbes, 1892). Notornis 49, 19-28. - . & Lee, M. S. Y. 2008. Affinities of Miocene waterfowl (Anatidae: Manuherikia, Dunstanetta and Miotadorna) from the St Bathans Fauna, New Zealand. Palaeontology 51, 677-708. Musk duck can thus be considered completely aquatic: they never go on land. How strange that the most aquatic of waterfowl lives in Australia, the driest of continents. If captured and dumped on land, they can only slither along on their bellies like seals (Frith 1982). First association that pops up in my mind: Hesperornithes. That's one funky duck fo sho. Interesting post, I'm quite enamoured of musk ducks too too. They are a very unusual looking bird, especially from up close. I live very near a large suburban lake in Perth (Lake Monger) that has quite a lot of musk ducks. I'm posting because I have in fact seen a musk duck walk a short distance on the ground. I was walking past the lake one morning in April when I saw a male chasing a female in the water. She dove repeatedly, seemingly trying to escape him and this went on for at least 1 minute. Anyway, the chase was concluded when the female jumped out of the water and stood up on the grass. She stood upright like a cormorant, not like most ducks at all, and walked a few very short and awkward steps (the male did not follow). I remember this very clearly because I like the musk ducks and watch them most days as I walk past, but very rarely see one anywhere near the shore, let alone on the grass. Anyway, I thought it was worth putting that sighting on the unofficial record. Geoff - thanks indeed for this. The only observations I can see in the waterfowl literature refer to 'sliding on the belly' as the best attempt at terrestrial locomotion, with some authors saying a 'half-erect posture' might be possible. Was the female bolt upright, as implied by your comparison with a cormorant? It may even be that females are more agile on land than males; not surprising in view of the size difference. The only observations I can see in the waterfowl literature refer to 'sliding on the belly' as the best attempt at terrestrial locomotion, with some authors saying a 'half-erect posture' might be possible. Was the female bolt upright, as implied by your comparison with a cormorant? Picture of musk duck out of the water here. Good work :) Looks weird, but demonstrates that 'ONLY able to move on belly like a seal' is not correct. Damn facts, always getting in the way of fine assertions. I didn't know about this bird before! Their poor terrestrial locomotion reminds me of hesperornithines. One of my favorites. Very interesting male advertising display too. Slight bit of correction: McCracken et al. 1999 does indeed find that musk ducks are not just distant from Oxyura, but are not oxyurine at all. I haven't seen anything but the abstract of Worthy & Lee 2008 (which you forgot to provide the full reference for, incidentally), but that abstract seems to be saying that musk ducks *are* oxyurine. "These results cast doubt on the distinctiveness of Dendrocheninae Livezey and Martin, 1988, and instead suggest oxyurine affinities for the Miocene fossils Mionetta, Dendrochen, Manuherikia and Dunstanetta, and the modern Biziura, Thalassornis, Oxyura, Nomonyx, Stictonetta and Malacorhynchus." Sounds like problematic analysis. Thalassornis in/ >Oxyurinae? Not likely. And it sounds like all the weird Australian ducks have just been pushed together here. I should also point out Hackett et al. 2008, which found Biziura, Malacorhynchus, Oxyura, Anser, and Anatinae in a five-way polytomy. The reasons for this polytomy are bizarre, and I really should write that up. But anyway it shows that musk duck isn't all that close to Oxyura, even though it doesn't rule out a monophyletic Oxyurinae. Just added Worthy & Lee reference, thanks for flagging that up. On their position for Biziura, what they conclude in the text is a bit different from the abstract. One of their favoured cladograms (Text-fig. 10: topological constraints imposed; diving-related characters excluded) shows Biziura outside (oxyurines + (tadornines + anatines)), and they say on p. 702 "Biziura and Thalassornis either form a clade within the oxyurine lineage or, more probably, form monophyletic branches off the main anatid stem immediately above Dendrocygna (Text-fig. 10)". So, I think they definitely favour the idea that musk ducks are outside Oxyurinae. As for McCracken et al. (1999), what I say above - that Biziura is not close to Oxyura as per Livezey - was not meant to contradict the inference given by the former authors (viz, that Biziura may be outside 'conventional' oxyurines). Rather, I was contradicting suggestions that Biziura and Oxyura might be sister-taxa. And I should have cited Hackett et al. - what can I say? I was in a hurry, and the bit on affinities was very much added as an afterthought. Afterthought for you, chief obsession for me. While I'm at it, Gonzalez et al. 2009 show essentially the same polytomy. Gonzalez, J. Duttmann, H., Wink, M. 2009. Phylogenetic relationships based on two mitochondrial genes and hybridization patterns in Anatidae. J. Zool. 279:310-318. 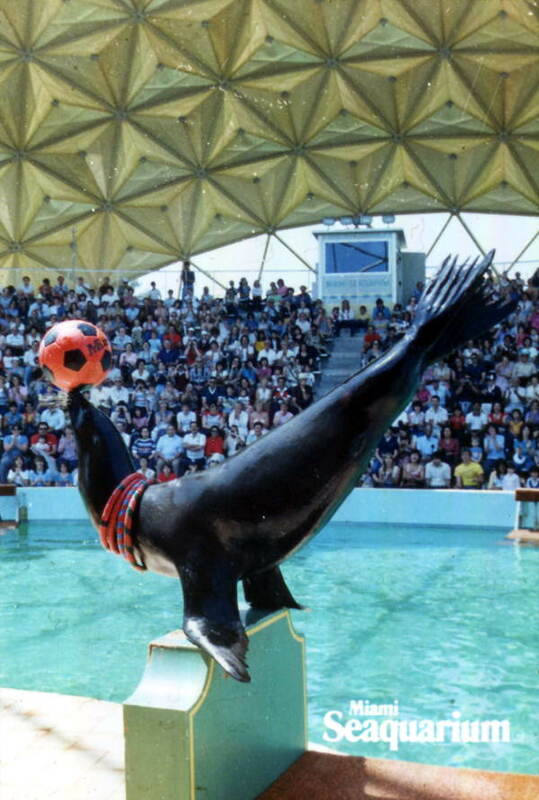 Looks weird, but demonstrates that 'ONLY able to move on belly like a seal' is not correct. Damn facts, always getting in the way of fine assertions. I hope I didn't ruin your plans of writing a paper titled 'Predicting the potential terrestrial walking ability of musk ducks by computational analysis'. ThatÂ´s really fascinating. I already knew musk ducks, but I had absolutely no idea how freakish they are. Stupid question: How do they breed? Do they built floating nests or where are they laying their eggs? Tetrapod Zoology: Where ordinary animals go to become officially weird. Interesting bird. Would like to see more on their aquatic nesting behavior. Several websites mention that they're awkward in flight. Maybe a word or two on their unusual anatomy is warranted here. As they sit very low in the water, takeoff physics must be interesting. Wonder if their feather oil has unique properties. 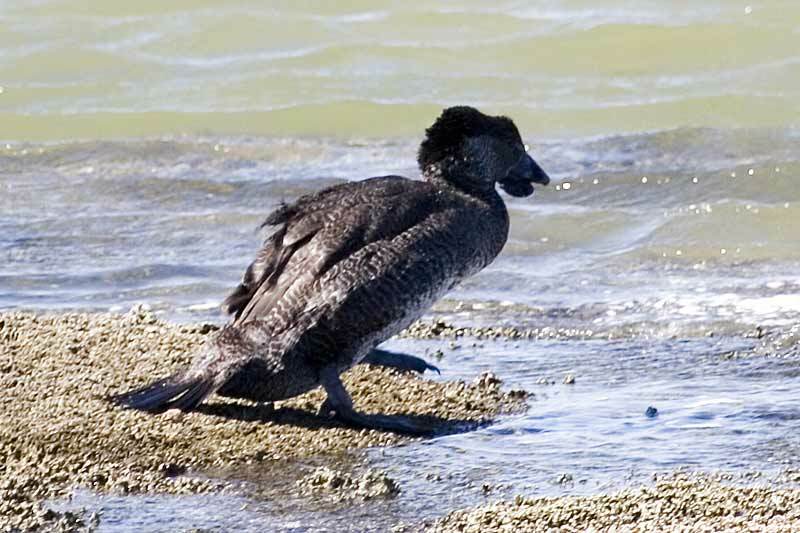 A male Musk Duck at Lake Wendouree (Ballarat, Victoria) could be lured out of water with offerings of hamburger. He moved half-upright in a rush for a few steps and then fell on his belly, got up and repeated for several yards. I have seen a captive male fed chicken wings by hand. They were firmly held by feeder but he just wrenched them apart, joint from joint, and swallowed whole. A serious predator, of other birds' ducklings, as well as fish etc. Another odd point - as I have seen myself, the female catches live prey, often yabbies (crayfish) and feeds them direct to her ducklings from her beak. I believe no other duck species does this. One of my favourite species. Glad it got a mention. A duck that eats other species' ducklings just sounds so... wrong. On the other hand however, perhaps it's just a logical step up from eating fish. The common merganser Mergus merganser, the fish-eating anatid par excellence, also supposedly kills and eats other species' ducklings on occasion (at least in captivity). Speaking of which: Darren, dares one hope that a post about mergansers will be forthcoming in this Amazing waterfowl series? Aquatic nesting behavior? Maybe birds can become fully marine after all. "A duck that eats other species' ducklings just sounds so... wrong." But probably not that unusual. Heck, a lot of birds feed on each other's young. The toucans, which are supposed to be primarily frugivorous according to a lot of popular animal books, actually use that long bill of theirs to pluck baby birds from their nests. And for those outside Australia who want to see a live one - according to ISIS Apenheul Primate Park at Apeldoorn in the Netherlands has 3. (gender not reported)These are the only 3 in zoos anywhere but Australia. According to the Handbook of the Birds of the World, there is only one other anseriform species that feeds its young: magpie goose. Something about Australia? Amazing waterfowl indeed! And, speaking of amazing, a message of gratitude might be in place: your blog is amazing. Being a teacher, i often use it in class (always without permission) so a Thank You is the least i can do! It's interesting to me that there were two distinct morphological routes birds took to becoming aquatic. In both cases the hind limbs drifted to the rear of the animal, but with the wing-propelled Sphenisciformes this was done so that a competent ability to walk on land was retained, but with the foot-propelled Gaviiformes and Podicipediformes, a distinct decline in terrestrial locomotion occurred. Or is it the case that early penguins were very loon-like and hence that they went from being able to walk well, to half-way losing that ability, to walking upright as they do today? these critters sound seriously cool. a shame i never met them while in australia. looks like now a visit to appeldoorn was in order. For future consideration: magpie goose (who isn't interested in a 3-way? ), pink-eared duck, blue duck (NZ), torrent duck, mergansers (seconded), shovelers, pygmy geese. And if Biziura is not a member of the Stifftail group, how come it sits on the water with tail cocked vertically, just like the genuine Stifftail Bluebilled Duck, so often seen on the same waters? And while you're on highly aberrant waterfowl, how about the Australian Freckled Duck Stictonetta naevosa? Well, it does have a stiff tail. Biziura resembles stifftails in a variety of ways. But it all appears to be convergence, based on the molecular data. And based, apparently, on Worthy & Lee's morphological analyses too. One more aberrant stifftail (a real stifftail, too) for consideration: Heteronetta atricapilla the only anseriform obligate brood parasite. Opposite to this highly aquatic duck, are there highly terrestrial ones (more than e.g. Neochen)? Here in Brazil "duck" (pato) usually refers to Cairina moschata (muscovy duck, but it should have priority for the "musk duck" name IMHO ;). It's the only bonafide domesticated fowl in South America AFAIK, but few know about it. Those who do hear about this often get the wrong picture, mixing them with mallards and assuming a "one wild duck species -> one domesticated duck species" scenario. Hawaiian Nene Branta sandvicensis are also highly terrestrial. I know there are plenty of fossil waterfowl that seem highly terrestrial: Moa-Nalos (Chelychelynechen, Thambetochen, Ptaiochen), those New Zealand Geese (Cnemiornis), and that Kauai duck featured here previously (Talpanas lippa). Those are the ones that I can think of off the top of my head. Yes, but we were specifically talking about anatids. Apart from Biziura lobata and perhaps Mergus merganser I know of no other duck, goose, or swan species that actually preys on ducklings (or other young birds). If you do, please list them. And so is the Australian Cape Barren goose Cereopsis novaehollandiae; screamers excluded, Cereopsis is probably the least aquatic of all extant anseriforms. Neat. I wasn't familiar with Cereopsis before. Thanks Dartian; it's another reason for me to visit Australia and take in its awesome fauna. Thank you, Sebastian, the Nene looks like a very interesting case of in-progress island adaptation, while a top contender for being a land-duck :). The fossil taxa are even cooler, with flightlessness associated to terrestriality in an ancestrally flying aquatic lineage. Dartian, Cereopsis is looking good as a terrestrial duck: "They also avoid entering water except when injured, molting, or as juveniles". Thanks! What can be plainer than that the webbed feet of ducks and geese are formed for swimming? Yet there are upland geese with webbed feet which rarely or never go near the water;[...] In such cases, and many others could be given, habits have changed without a corresponding change of structure. The webbed feet of the upland goose may be said to have become rudimentary in function, though not in structure. Thus, we can hardly believe that the webbed feet of the upland goose [...] are of special use to these birds; [...] We may safely attribute these structures to inheritance. But to the progenitor of the upland goose [...], webbed feet no doubt were as useful as they now are to the most aquatic of living birds. This is a species of the semiarid, open grasslands of Patagonia, sometimes occurring relatively far from water. Except when flightless or with broods, the birds are completely terrestrial, and are found most often in cultivated pastures and grassy valleys. Grassy islands or stream shorelines are favored territorial and brood-rearing areas in the Falkland Islands, and larger green areas, often far from water, are used by nonbreeding flocks. Grassy areas near the sea are used by birds approaching their molt, so that they might escape to the sea when flightless. For something as dirt cheap as toe webbing, it doesn't need to be useful very often at all to continue to be selected for. Precisely how often seems like a good topic for a thesis. Darren, one more good topic would be a survey of Dendrocygna. They're interesting partly because they're not at all unusual. That is, their morphology remains largely similar despite the fact that they vary from feeding almost exclusively by diving to feeding almost exclusively on land. You have to squint your eyes way down to find any adaptations to these varying habits. Besides, they're an extremely old genus, having almost as much genetic variation within the genus as within the rest of Anatidae. Again, conservative. Why? As an example, all other diving ducks swim underwater with a particular stroke: legs pointed backwards and with simultaneous backstrokes, as opposed to the paddling of surface swimmers. But it appears that whistling ducks swim underwater with the surface-type, paddling stroke. Or so I gather from the only data I have, a photo in Frith, H. J. 1967. Waterfowl in Australia. Angus & Robertson, Sydney. duck, swans, true geese, and two "aberrant" species. the front toes are fully webbed. Most of the swans and geese are quite strongly migratory, but the insular Hawaiian goose not only has become nonmigratory but also has become semiterrestrial and has evolved reduced toe webbing as it has adapted to a mountainous existence on old lava fields. Compare http://commons.wikimedia.org/wiki/File:Nenetall_tj.jpg and http://commons.wikimedia.org/wiki/File:Wild_goose.jpg for Nene versus the probable ancestor state in B. canadensis. Of course, both are webby compared to http://commons.wikimedia.org/wiki/File:Magpie.goose.sideon.arp.750pix.j… ("the only species of true waterfowl with only partially webbed feet", ibidem). I wrote a response with a few links to waterfowl feet pics (and quotes) saying that it seems webbing is a constant in extant species. Then the spam filter ated it. Thalassornis (white-backed duck) was formerly considered a stiff-tail and still is in many people's minds. However, it is an odd whistling duck (not so odd if you see D. bicolor hiding in vegetation). That a second 'stiff-tail' isn't shouldn't be a big surprise. By the way, did you know that Biziura can talk? One captive-reared bird was reputed to mimic âyou bloody foolâ and a squeaky door. They taught the duck to swear? That's Australians for you. Is video footage of this amazing individual available anywhere? Ahh, Darren provides a clue on the submarine body profile of the Musk Duck, in a previous cool post on Steamer Ducks. If your diet features the young of other duck specis, a low profile might afford an advantage for an covert maneuver of grab of duckling lunch while avoiding the alert eye of a parent. On webbed feet in upland ducks and geese: Drylands are a relatively recent ecotype. These birds migrate and may spend time at riverine or shoreline environments. And, the upland grassy terrain may not present a mobility difficulty for webbed feet. Indeed, the webbed flat foot could be an asset for walking about on spongy grasses. They used to have one these in the early days of Pensthorpe Waterfowl Park (now immortalised by BBC's 'Springwatch') - used to be great fun to watch, and I kinda miss it - cool bird!